It's funny, because when it comes to food, it seems like there are two types of people. There are the "semi-homemade" chefs and the full blown, homemade everything chefs. Some people think that taking the semi-homemade way is a cop out but I feel like the occasional easy meal keeps for a well-rested home cook. Sometimes though, I like to challenge myself. I know that it seems like everything I make is a sure winner, but that's only because pictures are a lot more forgiving than taste buds. And sometimes, I mess up things so badly, I don't even post them because I'm so ashamed! But these little things, they are not one of my failures. 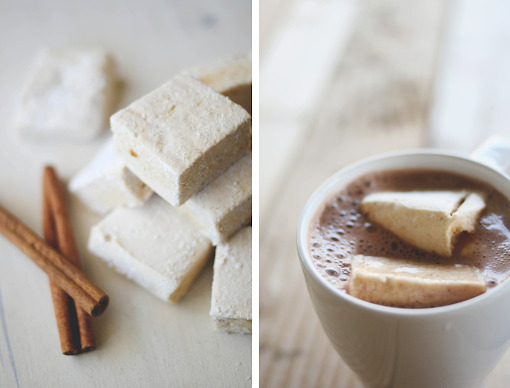 Homemade marshmallows have been on my to-do list since forever. I've always had this notion in my head that they would be difficult because I mean, I've never really had homemade marshmallows, ever. After reading numerous times about how easy marshmallows are, I really couldn't pass the opportunity to make pumpkin pie marshmallows. 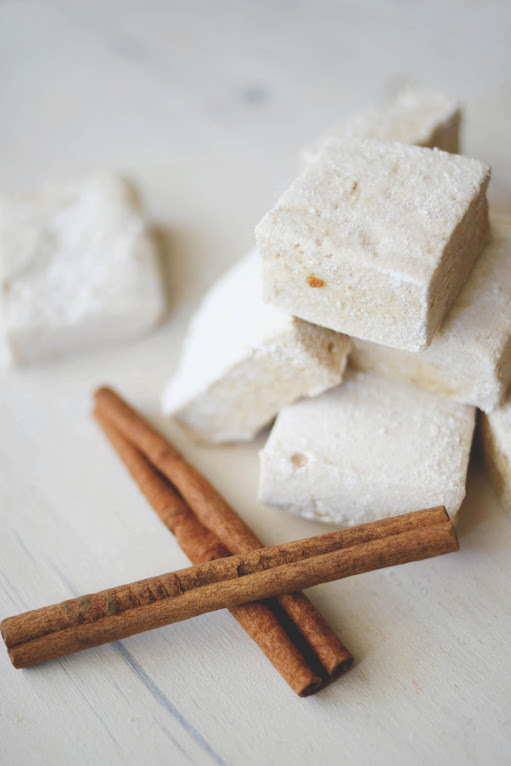 Seriously, pumpkin pie marshmallows?! Anyways, these were a cinch. The only hard part is dealing with the clean up, because you better believe that these things make for a large mess... in every single corner of your kitchen. Powder everywhere, sticky pots and pans... oy vey! But, the upside is that you're rewarded with little puffy pillows of sweet and spicy goodness. These were really sweet, like, really sweet. A bit too sweet for me to be eaten alone, but perfect in a cup of bittersweet hot chocolate! Combine the powdered sugar and cornstarch in a small bowl. Line a 9x13" baking pan with parchment paper, spray lightly with non-stick spray, then dust with 1/3 of the sugar-cornstarch mixture; set aside. Place 1/2 cup of the cold water in the bowl of a stand mixer fitted with the whisk attachment. Sprinkle the gelatin on top and stir to distribute. Let the gelatin dissolve for at least 5 minutes. Place the remaining water, corn syrup and sugar in a medium saucepan over medium heat. Stir to dissolve the sugar and increase the heat to medium-high and insert a candy thermometer. Allow the mixture to cook without stirring until it reaches 240 F on a candy thermometer, about 8 minutes. Immediately remove from the heat and carefully pour the hot syrup into the stand mixer with the gelatin. Turn the mixer on low to combine, then turn the mixer to high and whip for 12 - 15 minutes or until the mixture is stiff and shiny. While the marshmallow is whipping, combine the pumpkin puree, spices and vanilla in a small bowl. When the marshmallow is ready, fold in the pumpkin mixture and stir well until there are no visible pumpkin streaks remaining. Pour the mixture into the prepared pan and smooth the top. Dust with 1/3 of the sugar-cornstarch mixture and let it sit uncovered for at least 8 hours, preferably overnight. 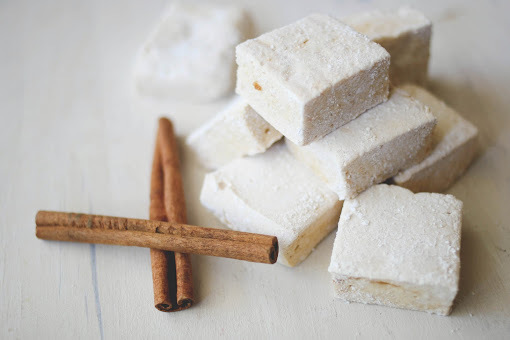 Turn the marshmallows onto a cutting board and cut into 1 1/2" squares. Dust the sides with the remaining sugar-cornstarch mixture. Store in a container with the lid slightly ajar for up to 3 days. Enjoy! Nummy looking tries I invite for learning how (Ai Chicago-Culinary Art notes for Creative Culinary Recipes. Yum! 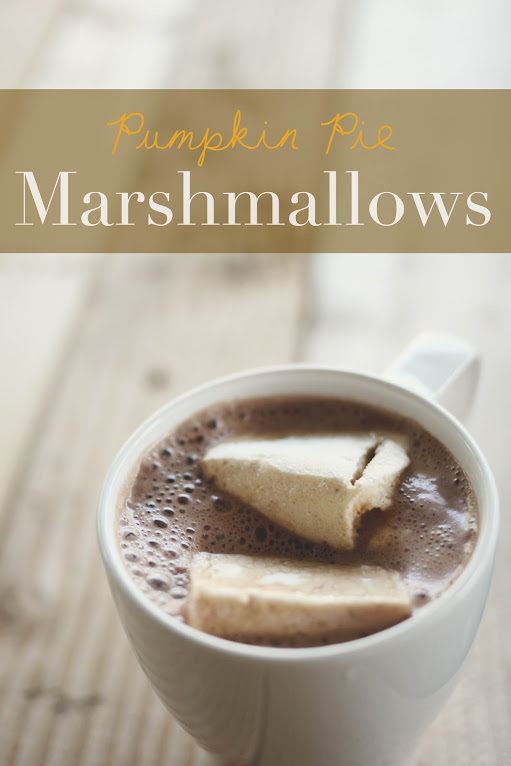 I never thought to make pumpkin marshmallows before. Gorgeous! I made marshmallows for the first time last year but mine stayed pretty sticky. Next time I'll let them sit and dry longer. omg. get fucked... i want one so badly! 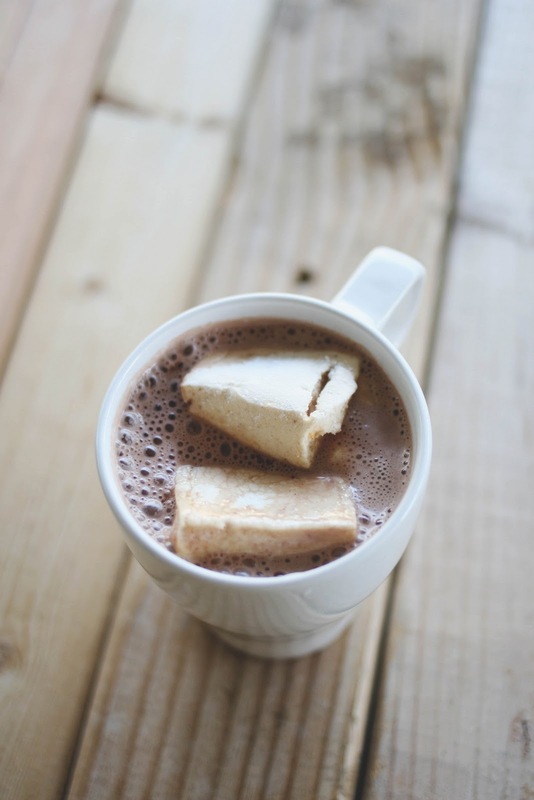 Love making homemade marshmallows! The flavors are endless, and they're so much fun. I've even learned how to (sort of) manage the mess so things don't get too out of control. Can't wait to try this flavor...perfect for fall! wow so yummy *_* your blog is so lovely and interesting. im glad if you visit my blog, too <3 keep in touch! sounds so good! I shared on my FB page. Thanks you!! !